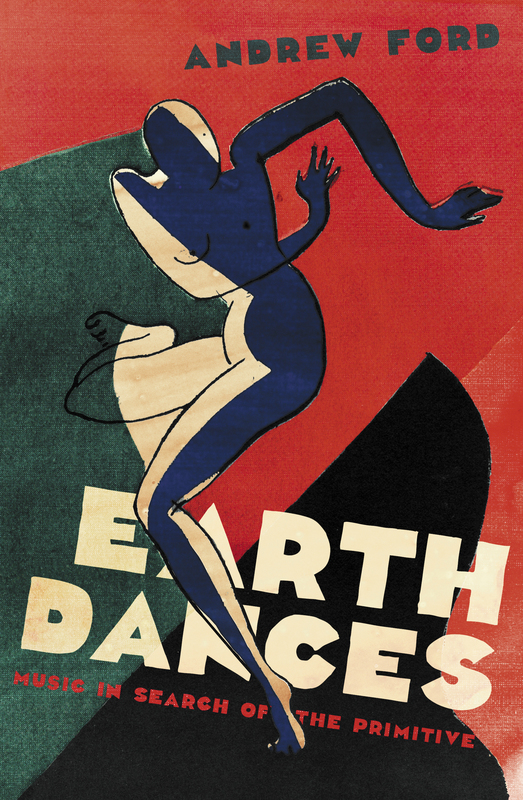 Earth Dances. Cover by Peter Long. Courtesy of Black Inc.
Andrew Ford’s Earth Dances explores the ways in which musicians from diverse genres and backgrounds have sought to “rough up” their music. Sometimes the most simple premises are the most interesting, as Ford’s wide-eyed incursions into rock, pop, classical and contemporary art music show. Ford interleaves fascinating interviews with contemporary composers with his own essays on the body, percussion, the voice, drones and childhood. Ford works every canonical composition you could reasonably expect into the book. The Rite of Spring gets its obligatory half a chapter, though Ford goes beyond merely discussing Stravinsky’s “sophisticated aping of violence.” Ford is more interested in the difficulties this violence posed for an early twentieth-century ballet. He discusses Stravinsky’s dissatisfaction with its ending and the work’s adherence to a balanced form that recognises the diminishing returns of extreme dynamics. As well as canonical works, the book is brimming with idiosyncratic references that bring out Ford’s personal tastes. Earth Dances opens with the example of Elliott Carter’s A Symphony of Three Orchestras, where Carter appears to sabotage the refinement of his own work with a brutal orchestral meltdown. This example brought to mind another case of musical self-sabotage, the beginning of the Rautavaara Harp Concerto, where the giant orchestral boot crushes the fledgling opening theme several times with exceptional cruelty. Some days you have to skip it. At the opposite end of the classical-popular divide Ford discusses the appeal of anti-folk singer Daniel Johnston, as well as Robert Davidson’s viral setting of Julia Gillard’s misogyny speech Not Now, Not Ever. The book’s great strength is Ford’s dexterity in jumping from example to example, which inspires the reader to situate their own musical world between intellectual and corporeal poles. I like this term, “intimately” political where many would reach for “inherently” or “fundamentally,” implying an interactive duality between musical and political interests. Pauline Oliveiros discusses the practice of “deep listening” and Brian Eno recounts the adventure of American minimalism’s response to European modernism. The book’s all-encompassing theme threatens to be its most unsatisfying feature. Earth Dances contains as many examples of musicians see-sawing between intellectual and corporeal modes of composition as it does explanations of why they do it. According to Ford, a composer may rough-up their music to serve a dramatic imperative, to serve humanist or nationalist ideologies, to shock or to reinvent their practice. One important reason is left out: to make a buck. While Ford acknowledges that the corporeal, “primitive” musical pole exists between quotation marks, defined through its contrast with Western ideals of refinement and civilisation, there is no real discussion (outside of Lim’s remarks) of issues of cultural appropriation and exploitation, of the refinement in the “primitive” and so on. To be fair, many have written that book before and I am just as interested in the formal yo-yo of music history as the West’s bloody-minded fascination with its Others. All the same, Ford could have acknowledged the thorny political issues that arise when, for instance, Paul Simon sells a bazillion copies of an album featuring recordings of black musicians in Johannesburg made under anti-apartheid sanctions. Ford could also have made more of the contradictions between different forms of the corporeal aesthetic pole. As Bresnick’s musica povera shows, simple does not necessarily equal rough. Is American minimalism a simplification, refinement or a roughing-up of a previous aesthetic? Ford frequently returns to the idea one veers toward the “primitive” pole to make way for renewal. If so, then has minimalism led to formal recomplexification, or is it a musical apotheosis? I like to imagine a four-phase cycle with the destruction of a “rough” aesthetic making way for simplicity, from which a new phase of construction begins leading to complexity, but can such a cycle really be found in anybody’s practice? Ford bookends Earth Dances by associating his intellectual/corporeal divide with the structural anthropologist Claude Lévi-Strauss’ book The Raw and the Cooked. In one sense, this is entirely correct. Structuralism’s gift to musicology has been the idea that music resembles and indeed interprets myth through contrasting and interconnected themes. On the other hand, The Raw and the Cooked presents precisely the opposite theory of musical development to Ford’s yo-yo. In an extended criticism of serialism and musique concrète in the book’s “Overture,” Lévi-Strauss compares music to a language because they are both based on shared, limited sets of elements. Just as all English speakers recognise the same few phonemes, we all recognise the same set of pitches related by the hierarchy of overtones. His idea was torn to shreds by successive generations of composers, critics and musicologists. The diversity of temperaments and scales around the world is enough to refute his claim, let alone the genuinely communicative and thrilling experiments of modern music that readers of this blog will be familiar with. Lévi-Strauss admitted that he didn’t like or understand the music of the cultures that he himself studied. But to Lévi-Strauss the “harmonic grid of selection” is immutable and irreplaceable. He did not believe that any amount of roughing up could make way for a new one. This is evidently a live issue, because Ford’s book came out around the same time François Mitterand’s ex-economics adviser and some-time conductor Jacques Attali used Lévi-Strauss’ idea of the harmonic grid to call atonality “musical terrorism” (and this from the author of Noise, a book that crassly equates Western art music’s formal history with the economic stages of historical materialism). It is obscene to compare musical violence to the actual taking of lives (see the interrelated but distinct political and musical priorities above). But Attali raises a valid question: Does musical destruction merely peck around the edges of musical norms, or is it a genuine step in the process of musical innovation?